Manufacturers Index - J. King & Co. In 1868, J. King & Co. won an award at the Indiana State Fair for best drag sawing machine; the exhibitor was identified as Jacob King. The next year, King & Pinney of Indianapolis exhibited a drag saw and a stave machine, the latter winning a bronze medal. By 1873, King was working for woodworking machinery manufacturer Berner, English & Over. Tenth Report of the Indiana State Board of Agriculture , 1868. Best drag sawing machine, J. King & Co., Indianapolis. Silver Medal. ... "The operation of this machine has satisfied the most credulous of its utility and the great advantages to be derived from its use, and the best evidence of its practicability is the uniform satisfaction given in every case when it has been tested, and the more thorough the test, the greater the approval. The advantages of this machine is the rocking motion given to the saw by an eccentric on the shaft, thereby clearing the kerf of the saw-dust at every motion. An illustration accompanies the above writeup; the caption gives the company name as "Jacob King & Co."
Eleventh Annual Report of the Indiana State Board of Agriculture , 1869. At the annual State Fair, King & Pinney, Indianapolis, drag saw: "sawed off black walnut log, seventeen and one-half inches in diameter, three times in two and one-half minutes." Eleventh Annual Report of the Indiana State Board of Agriculture , 1869. At the annual State Fair, King & Pinney, Indianapolis, Ind., Stave Machine: Bronze Medal. 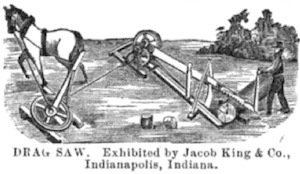 Jacob King of Indianapolis was granted an 1868 patent for a ditching machine; the patent was jointly assigned to himself, James Hamilton, and B. L. Stokely. He was also granted an 1873 patent for a grain drill, which was assigned to himself and Berner, English & Over. An 1884 patent for a grain drill was granted to Jacob King of Logansport, IN, and assigned to King Drill Co. of Logansport.